This reading describes the energy level of the crowd as they watch Jesus enter Jerusalem on a donkey. They can feel the great love Jesus has for them. They are excited and ebullient. Their devotion to Jesus is contagious. The lower trigram is Wisdom, whose image is Earth. 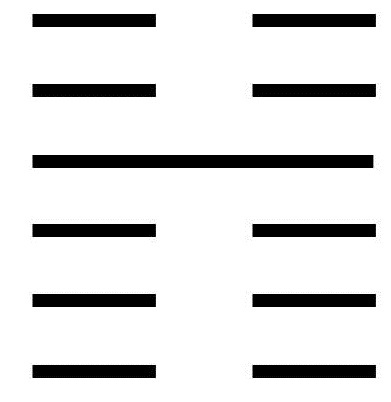 Earth, in this hexagram, refers to one who is grounded. The upper trigram is Word, whose image is Thunder. Thunder is the sound of Enthusiasm. To watch devotion gain momentum and erupt into enthusiasm. To understand that enthusiasm is directed at one who holds the interests of the people most dear. To take advantage of the enthusiasm to unify popular movements, to invigorate helpers, and to achieve great goals. To encourage enthusiasm by treating others with respect. To recognize the power of music to bring people together joyfully and unleash bursts of creative energy. A moving line in the bottom position warns of an arrogant person who tries to get ahead by boasting about connections. When enthusiasm is rooted in Ego, it degenerates into arrogance. Arrogance leads away from God and causes disunity among the people. A moving line in the second position warns not to be misled by illusions or dazzled by enthusiasm but to remain centered and cultivate Wisdom. One must not flatter those higher or ignore those lower. It is important to watch for signs of good fortune or discord, and when either occurs, to take appropriate action immediately. A moving line in the third position describes a time of seeking a great leader and warns against ambivalence. There is a right time for approaching the leader, and when that moment occurs, there should be no hesitation. A moving line in the fourth position describes one who is able to awaken enthusiasm through sureness and action. Self-confidence and sincerity attract people. But the enthusiasm must run in both directions; as the people are enthusiastic about the leader, the leader must also be enthusiastic about the people. A moving line in the fifth position describes enthusiasm that is being obstructed. This obstruction is not necessarily bad. It may be offering protection from squandering energy at a time when energy is needed to maintain survival. A moving line in the top position warns about being deluded by enthusiasm and having one’s vision distorted. But if this happens, all is not lost. If one awakens from the delusion, change is possible and the right path can be found again.